American labor-leader; born in London Jan. 27, 1850. At ten years of age he became a wage-earner, working in a shoe-factory; later he was apprenticed to a cigar-maker. 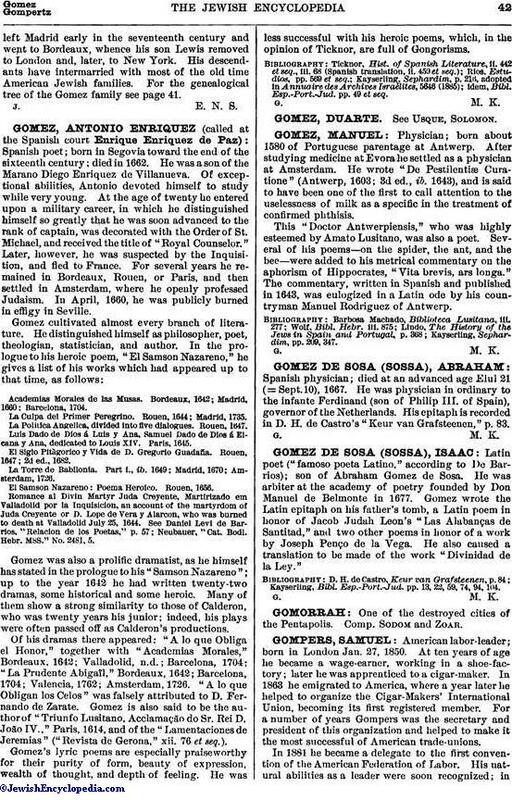 In 1863 he emigrated to America, where a year later he helped to organize the Cigar-Makers' International Union, becoming its first registered member. For a number of years Gompers was the secretary and president of this organization and helped to make it the most successful of American trade-unions. In 1881 he became a delegate to the first convention of the American Federation of Labor. His natural abilities as a leader were soon recognized; in1882 he was elected to the presidency of the Federation, the chief representative body of working men in the United States, possibly in the world, its membership being estimated at over 2,000,000. He has been continuously reelected president, except in 1894, when he was defeated by John McBride. The first six years of his presidency he served without remuneration, and he also paid his own expenses incidental to the agitations of 1886 in favor of the eight-hour law. 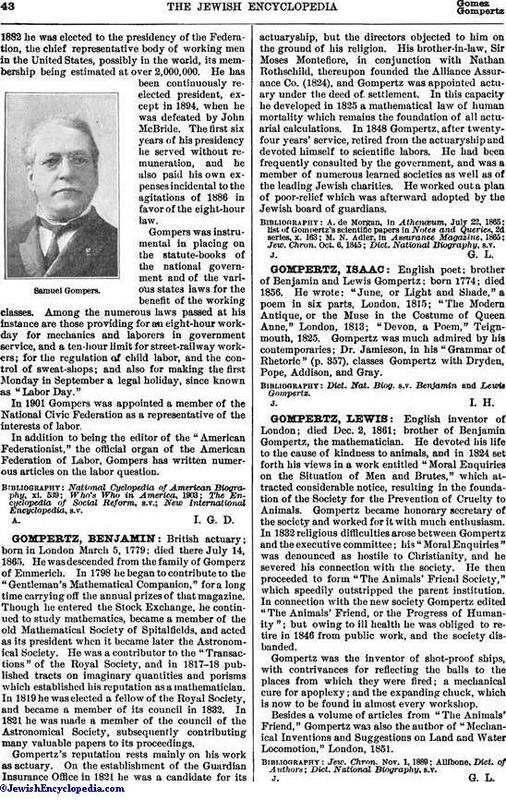 Gompers was instrumental in placing on the statute-books of the national government and of the various states laws for the benefit of the working classes. Among the numerous laws passed at his instance are those providing for an eight-hour work-day for mechanics and laborers in government service, and a ten-hour limit for street-railway workers; for the regulation of child labor, and the control of sweat-shops; and also for making the first Monday in September a legal holiday, since known as "Labor Day". In 1901 Gompers was appointed a member of the National Civic Federation as a representative of the interests of labor. In addition to being the editor of the "American Federationist," the official organ of the American Federation of Labor, Gompers has written numerous articles on the labor question.